Dogs love to chew. This is a well-established fact. But instead of allowing them to chew on your furniture or other hard objects in your home, you’ll do better to give them any of these 8 best bones for dogs either natural or synthetic. Not only are you satisfying your dog’s innate nature to chew, you’re also providing them a healthier and safer means of cleaning their teeth and minimize if not eliminate canine boredom. Fans of Nylabone can rejoice in the fact that the company has a dog chew that is especially designed with the consistency and texture of real bone. 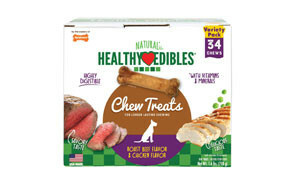 The good thing about the Healthy Edibles Dog Chew Treat Bones for Petite Dogs is that these won’t crack, split, or splinter so your pet can take all the time to chew and munch on these treats. The variety pack of the Healthy Edibles contains a collection of roast beef and chicken flavored treats although you can have the option to go with the single-flavor variants like bacon, turkey and apple, and filet mignon. Each treat is guaranteed to contain at least 1% protein and only half a percent of fat. It utilizes only natural ingredients and doesn’t include anything artificial or harmful for your pet. Blue Buffalo is one of the trusted brands when it comes to premium-quality, grain-free dog food. It is not surprising that their BLUE Dental Bones Natural Dog Chews is also doing remarkably well especially among pet parents who are already familiar with the brand. The BLE Dental Bones are formulated to contain no less than 14% protein and 3.5% fat to mimic the meaty bones that ancestral dogs have feasted on. While the BLUE Dental Bones is made of natural ingredients without the dreaded gluten or even poultry or chicken byproduct meals, its consistency, texture, and density still pales in comparison to real bones. On a more positive note, however, you will never have to worry about splintering or the broken pieces causing intestinal or even esophageal problems for your canine friend. And with the addition of parsley and thoughtful notched design for fresher breath and more efficient cleaning of the teeth, respectively, you cannot ask for more. 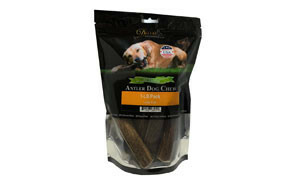 In the tradition of bully sticks comes this equally effective dog chew by Deluxe Naturals. Utilizing only naturally-shed antlers from elk that roam the mountainous landscapes of the northwest as well as in heavily forested areas, the Deluxe Naturals Elk Antler Dog Chews are an excellent alternative to real bones and even the famous bully stick. Each 6-inch long elk antler is guaranteed to contain at least 38.9% protein and only 1.2% fat. This is of course in addition to the rich calcium and phosphorus that it contains. While these are not designed to replace your dog’s normal diet, an elk antler dog chew is believed to be a great treat for dogs since it doesn’t contain any preservative or artificial flavoring or coloring to enhance its appeal to your dog. Once the antlers are harvested, they are thoroughly cleaned, sanitized, and packed immediately to preserve as much of its nutrient content. At the very least, there’s no need to worry about this chew breaking apart easily. The bone chew formulation of Purina is quite unusual yet very surprising. Somehow the company decided to design a dog chew that mimics real bone complete with a soft, spongy tissue in the middle by incorporating real meat into the synthetic bone. 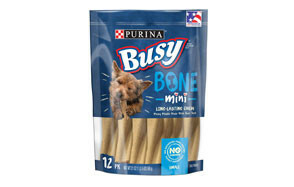 The Busy Bone Mini Dog Treats looks, tastes, smells, and feels like a real bone. The addition of real meat in the center should further attract your dog to start munching on it right away. It’s completely edible, of course, and is guaranteed to contain not less than 1% fat and 5% protein. These figures may be low, but considering these are treats then the protein and fat content should be just fine. Their miniature size makes the Busy Bone a great positive reinforcement tool during dog training activities. You’d only wish they came in other flavors. For pet parents who don’t like giving their dogs synthetic bones regardless of how realistic these have been made, the Pet ‘n Shape Beef Bone Natural Dog Treat is an excellent choice. You’ll find comfort in the knowledge that the cattle they source these bones from are organic – grass-fed and free-ranged. These cattle are never given antibiotics, hormones, or any other growth-enhancing products that are typically seen in industrialized cattle farms. What you get are all the natural goodness of meaty, tendon-filled beef bone complete with the calcium, phosphorus, glucosamine, and chondroitin that will be essential for your dog’s bone and joint health. The protein and fat content will also be a lot similar to raw bone. Each Pet ‘n Shape is slowly roasted to perfection, locking in the various flavors and nutrients in each beef bone. It truly is a treat for your pet. If you like the Pet ‘n Shape, you’ll go crazy with the Jack&Pup Premium Grade Roasted Meaty Beef Mammoth Femur Bone Dog Treat. Imagine a full 16.5 inches of beef long bone, sourced from organically-focused farms utilizing only the safest methods in growing cattle such as free ranging and grass-feeding, and you’ve got the Jack&Pup. Its humongous size alone is guaranteed to last a very long time. The femur is meticulously selected from batches of beef bones so only the best will ever get packaged. Flesh and tendon are left on the bone before these are naturally smoked and slowly roasted to lock in all the nutrients, aromas, and flavors of bone, cartilage, and muscle into a mammoth doggie treat worthy of a feast. The cooking process gives your pet canine all the nutrients that are present in these organs so you’re not only nurturing your pet’s inherent need to chew, but you’re also looking after your dog’s overall welfare. One of the issues with real bone is that it can break into splinters that can injure your dog’s digestive tract. If you’re concerned about this issue, then you may want to give your pet the Petstages Toy Beyond Bone. First, it’s a chew toy that is nearly indestructible so your pet can chew on it for hours on end; except, perhaps if your canine friend is a heavyweight chewer. The Toy Beyond Bone is a fully synthetic dog chew made of the sturdiest, most durable materials. Unfortunately, there are really no indications as to the specific kind of material this is made from. While dogs love it there have been issues about it breaking into pieces and causing bloody diarrhea in their dogs. The good news is that these have been isolated cases. Vigilance is still key whenever giving your pet bones, natural or synthetic. If you have observed your dog it truly has a fascination for wood. It can chew on the wooden leg of your chair or even on the wooden baluster on your stairs. Taking on this cue is Petstages whereby the brand came up with a wooden dog chew toy that they named Ruffwood. Made from natural dogwood – kind of woody plant known for its distinctive bark, berries, and blossoms – the Ruffwood offers your pet an entirely different kind of ‘bone’ treat that should be perfect for mild chewers. Since it is made of wood the risk of producing splinters is very real especially if you have a heavy chewer right in your pet family. The positive thing is that it floats so you can actually play with it with your dog in the pool. Picking the right dog bone is not really that simple as there can be quite a few considerations to think about. While our list of the best bones for dogs can help narrow down your choices, you may still want to embark on your own quest to search the best bone to give to your dog. This is why we have this buying guide just for you. What are the Benefits of Chewing a Dog Bone? The benefits of chewing dog bones greatly vary from the type of bone that you give to your dog, whether it is natural or synthetic. One of the main differences is in their nutrient content since some synthetic bones are typically enriched with other substances that may not be found in natural bone. These substances can be beneficial for your dog or can bring them harm. Nevertheless, chewing on bones, regardless of type, can provide the following benefits to your pet dog. When given a bony treat they are essentially working their brains, figuring out how to approach a particular bone. This is especially true for raw bone or even for processed natural bones that still have meat and tendons attached to them. For dogs, they have to figure out how to remove these bits of flesh, tendons, and ligaments from denser sections of the bone. They somehow know that before they can get to the core of the bone, they will have to work their way through these maze of tissues. This is what mentally stimulates them and what can help improve their cognitive development. The same is true with synthetics. Whenever dogs bite and chew on these items, they feel, taste, and even smell what they are working on. Since they are using their sensory organs they are technically improving their sensory perception. Regardless of the type of bone, chewing can help clean the teeth and gums leading to a healthier oral cavity. Of course, chewing bones is no match for a doggie toothbrush and toothpaste, but the point is that with the mechanical action of the bone rubbing and scraping against the surface of the teeth and gums, any large food particle or debris left on the teeth and gums can be easily removed. Some dog chew bones also come with specialized ribs that serve like toothbrush bristles to remove more stubborn particles. This helps prevent gum diseases and promotes optimum oral health. Everyone knows that dogs have a natural inclination to chew. It’s already in their genes, so to speak. If you don’t give them bones or chew toys to chew on, they will be looking for other things to do this with. They’ll see your carpet, your furniture, your bedding, and virtually anything else that they can grab their mouths with. There have been many instances where a house has been turned inside out because the dog was simply not given a less destructive means of acting out its innate chewing behavior. We mentioned above that chewing bones can help facilitate cognitive development in dogs. In addition to this, it can also help minimize canine boredom as well as the occurrence of behavioral problems. When you give your dog bones to chew on, you’re essentially keeping it very busy so it will not be thinking of anything else than the bone inside its mouth. This helps focus your dog only on one thing: the bone. Which is Best for My Dog – Natural or Synthetic Bone Chews? Choosing between natural and synthetic bone chews is more a matter of setting your priorities straight. If you want a product that is as close to the ancestral diets of dogs complete with the nutrients and the joys of munching on a real bone, then natural bone chews are for you. On the other hand, if you are wary about the safety of natural bone chews especially related to issues about contamination, then synthetic bone chews should be a great choice. Nutrient-wise, natural bone chews are far more superior to synthetic bone chews. This is despite the fact that some synthetics are enriched with nutrients. Unfortunately, the ingredients used in these formulations are very different from the actual nutrient composition of real, natural bone. Additionally, while contamination is a very likely possibility in natural bone chews, many synthetics are also laced with artificial preservatives, gluten, artificial colors and flavors, and other chemicals that may also prove to be harmful to your pet. Picking between natural and synthetic bone chew rests on your understanding of the pros and cons of each and which of these two you think your dog will benefit from the most. There are plenty of options if you do decide to give your pet dog bones. Unfortunately, it is also because of the dizzying number of options that can make choosing the right dog bone for your dog especially difficult. Here are some of the more common types of bones and how you can choose the right one for your pet. Experts say raw bones are the best especially if they still have plenty of meat, tendons, ligaments, and even bone marrow in them. These types of bones reflect dogs’ ancestral diets. While a lot of pet parents don’t like the idea of handling raw bones and flesh, experts actually recommend raw bones overcooked versions since these are generally softer than their cooked counterparts. Cooking bones essentially dries out the moisture inside, making them more brittle and more prone to breakage, causing splinters. Additionally, raw bones are more nutrient-rich than cooked bones. When bones are cooked some of the nutrients are eventually lost, leading to a substantial reduction in nutrient value. These are great alternatives to raw bones especially for pet parents who are wary about the germs that may be present in raw meat. These products are just like raw bones except that they undergo sterilization to kill the germs present in the product before these are slowly cooked, typically by roasting. As we have already mentioned above, the processes involved in the preparation of these bones can somehow affect the nutrient content of the bone and meat itself. Also, the cooking process has technically resulted in a dehydrated product that it is now more prone to splintering. These are not actually bones per se but rather made from other parts of an animal. One can look at these products as natural beef bones except that they are not made of bones. Rawhide bones are essentially made of the inner layer of the skin or hide of cattle or horses. These are not really appetizing at all. As such, some manufacturers add natural flavor enhancers to make it more palatable and enticing for your dog. If you do decide to get this type of bone for your pet, make sure that it is made of all-natural ingredients. There are certain bone chew products that are specially designed as dental bones. These are primarily geared for the removal of food particles and debris from your dog’s gums and teeth and to help promote healthier oral cavity. These can also serve to freshen your dog’s breath as well as massage and soothe its gums if inflamed. From the term itself, these dog chews are enriched with nutrients for the sole purpose of supplementing regular dog diet. These are especially helpful in instances where your dog is simply not eating that well. These are chew toys and doggie treats that are primarily intended for power chewers. They last longer than other types of bones for dogs. These are designed to be exceptionally difficult to break apart or splinter. Are Any Dog Bones Safe for My Dog? Based on what we have been discussing so far, raw bones are the safest for the simple fact that they are still rich with moisture, making them a lot softer and, thus, less prone to breaking and splintering. True, this type of bone will still break, but given that they are still dense with cartilage, the splinters that they produce have softer and rounded edges. On the other hand, cooked bones are brittle owing to the fact that the heat employed during the cooking process has effectively drawn out the moisture. Splinters, therefore, are sharper and harder or denser compared to raw bones. To optimize the safety of giving raw bones to your dog, it is imperative that you supervise your pet while it is enjoying its bony treat. At the first sign of breaking, you can immediately remove the bone. Also, if signs of choking are observed or any sign of a problem, you can institute measures immediately. Giving our dogs bones to chew not only nurtures their innate need for chewing, it also helps promote healthier teeth and gums, stimulate their senses, and help prevent behavioral problems. That is why it is important to choose the right bones for them.